Canada, New Zealand, Australia... the 'English-speaking world' used to be a key geopolitical concept. Post-Brexit, could it return? Jonathan Powell explores the Anglosphere. It used to be called "The English Speaking World," comprising Canada, New Zealand, Australia, America and a collection of smaller nations. 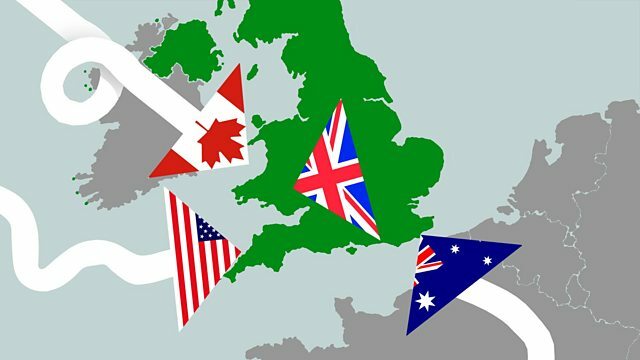 As Britain looks around for allies and trading partners post the EU is the Anglosphere set for a comeback? Is there a genuine cultural and political bond between Australians, Canadians, Americans and Brits, and a handful of Commonwealth nations, or are we looking at a complex world through glasses fogged with Empire nostalgia? Has Digital Culture created a world in which the English language is once again the dominant conduit of intellectual ideas and cultural exchange? Or in a world of China and Indian power is the Anglosphere a nostalgia kick for old white men? Jonathan Powell speaks to political and diplomatic figures to explore the power of the Anglosphere in a multi centred world.